Tom studied Drama & Theatre Arts at Goldsmiths College, University of London. 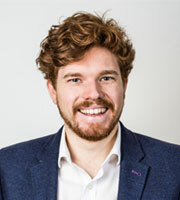 After graduating, Tom joined the full-service marketing agency AKA working in various teams over the four and a half years creating campaigns targeting tourists, teachers, coach operators and group travel organisers. In 2016, he joined the Ticketing department looking after campaigns with ticket agents reaching both individuals and the trade. Tom joins made as Senior Account Manager.